“To clarify”. With this slogan the “Viganò dossier” has been thought and presented, so as to mask its real goal: induce the hated Pope Francis to resign. There is a problem: the testimony, prepared badly and in a rush, contains falsehoods above-all in its key passages, which compromise its credibility. But beside damaging above-all Benedict XVI and John Paul II, it proved to be a boomerang against Carlo Maria Viganò himself. 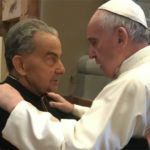 We addressed him eight (rhetorical) questions he had better not answer, because, beside casting shadows of complicity on him, they make his accusations against Pope Francis (and against Benedict XVI) definitely collapse. “The light eventually wins over the darkness”, said Viganò the day before yesterday to who has been discovered to be one of his proofreaders, Aldo Maria Valli. However, the “darkness” of the ex Nuncio’s past effectively compromised his dossier. We do not talk about his court cases, mentioned by us in other articles to highlight the difficulty these matters pose when Viganò asks us to trust his report devoid of proofs. 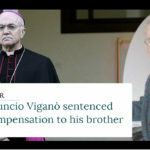 Charges of misappropriation of the family inheritance arrived from his brother Lorenzo, but Viganò himself denied them by publishing a notice by other brothers of his’. Let us acknowledge that, although it still has to be explained why he had to pay 180 thousand Swiss Francs to his sister Rosanna, after she denounced him for appropriating 900 million lire coming from his father’s inheritance (not to talk about Viganò’s bad habit of creating false dossiers against his enemies, at least according to the revelations by Luigi Bisignani). But that is not the point, as has already been said. Taking his dossier seriously and carrying out some investigations, we see that Viganò turns from accuser to accused: it was personally he to disregard the alleged order issued by Benedict XVI to Card. McCarrick to withdraw to private life – chief argument of the “Viganò dossier” –; it was he to be first the silent accomplice of the public life of the American Cardinal, although he knew about the accusations against him and about the (alleged) measures imposed on him. Viganò publically praised McCarrick, he declared to feel “affection” for him, celebrated the Eucharist side to side with the Cardinal he knew to be an abuser. And Viganò lied; he did many times, repeatedly. This “light won over the darkness” thanks to his very dossier; for this reason, the eight questions we pose him are a request of clarification towards his ambiguous position dooming him not to be a credible witness at all (and he did not answer these questions in the interview by Valli, who, being his minion, did not pose them to him). Let us always consider that, in any cases, his charges against Francis are unsubstantiated, (or, in the worst case, remarkably scaled down), as already proved by us in a precedent article. 1) MSGR. VIGANÒ, WHY, AS APOSTOLIC NUNCIO AND REPRESENTATIVE OF BENEDICT XVI, DID YOU NOT ENSURE THE RESPECT OF THE ORDER ISSUED BY THE POPE TOWARDS McCARRICK? In the interview he released to Aldo Maria Valli, Msgr. Viganò denied having been the leaker (in Italian “crow”) of Vatileaks: «At that time, I had long been in Washington and I had certainly other things to think about». He is perfectly right: at that time Viganò was none less than the Apostolic Nuncio in the USA, that is the representative of Benedict XVI in Washington. If we assume as true what Viganò writes, that is that Benedict XVI, aware of the abuses, forbade McCarrick from Eucharistic celebrations, public presences, and journeys, why did Msgr. Viganò not ensure the respect of this order to the Cardinal, and why did he not publicly protest when he himself had the role of representative of the Pope? In the video here below some clips dated 2011, 2012, and 2013 of the presence of McCarrick in the Vatican during the Pontificate of Benedict XVI have been collected, which shows the Cardinal was leading an untroubled public life (in New York and in Rome) long before the election of Francis (an exhaustive report was realised yesterday by Michael J. O’Loughlin). Catholic sociologist Massimo Introvigne pointed it out: «About “secret measures” by Benedict XVI against McCarrick nobody has ever known anything except Viganò, and against other illustrious clergymen charged with harassment Pope Ratzinger took public and clamorous measures. If then the orders of the German Pope were ignored, it would have been Viganò, as Apostolic Nuncio and therefore as representative of the Pontiff in Washington, to have to resign». Indeed, as we have shown, also in the period in which Archbishop Viganò was Nuncio in the USA, McCarrick celebrated Mass, travelled, released interviews, and above-all attended the Vatican together with a group of American Cardinals. Viganò was Nuncio in Washington from 2011 to 2016, and precisely in those years the Cardinal was a familiar face on the US television, was received in audience by Benedict XVI, concelebrated Mass by Saint Peter’s tomb, and celebrated Ratzinger’s birthday at the Vatican. If today Viganò accuses Francis of having disregarded that order by “rehabilitating” McCarrick into the Vatican, why did Msgr. Viganò – long before Francis – not do anything to ensure the respect of Ratzinger’s measure, but acted as an accomplice in its transgression by the Cardinal, who hung about even in the Vatican in the presence of Benedict XVI? Why did he not resign, after realising he was not fulfilling his duties? 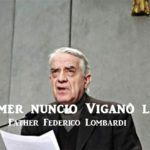 «If Viganò had been coherent, he should have resigned in the years in which he was responsible for the pontifical delegations» – wrote Francesco Lepore: «as he himself had learnt about the reports sent by the Nuncios Sambi and Montalvo». With what courage, Msgr. Viganò, do you dare to criticise Francis whilst you were the first to do nothing to make the order to McCarrick effective, which you claim had been issued by Benedict XVI? If you speak the truth, then you are the first guilty person and accomplice, and, before accusing Francis, you should accuse yourself and Benedict XVI; if you speak falsely, then such order has never existed, and thus your charge against Francis (and, consequently, against Benedict XVI) collapses. 2) MSGR. VIGANÒ, WHY IN 2013 DID YOU CELEBRATE MASS WITH THE ABUSER McCARRICK? According to a revelation by Msgr. Viganò, in 2009 or 2010 Benedict XVI, informed about the past abuses by McCarrick, intervened to order him withdraw to a private life, thereby forbidding him to do celebrate Mass. 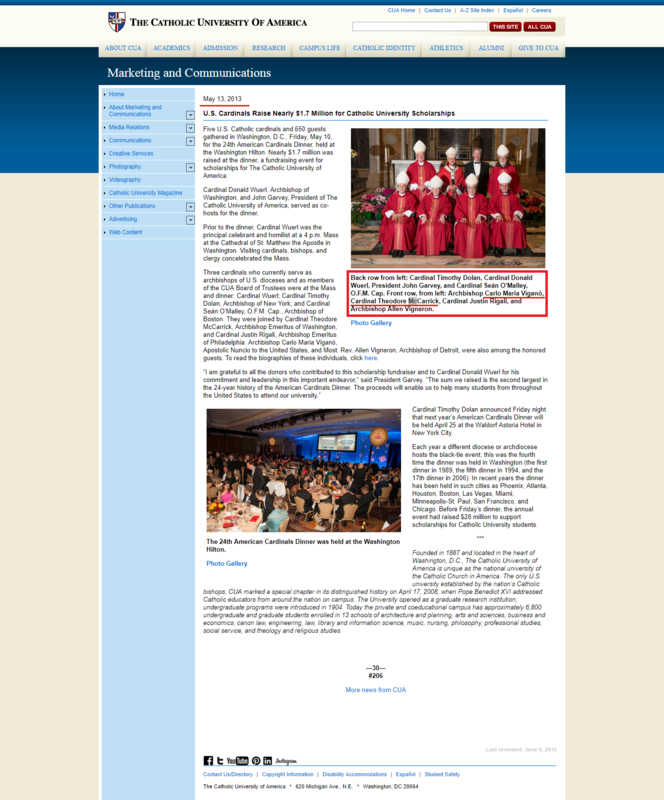 Nevertheless, on May 2013, before a charity supper at the Hilton Washington, former Nuncio Viganò concelebrated a solemn Mass even side to side with Card. McCarrick. In the picture here below, Viganò is immortalised in front of the altar and sitting near the Cardinal charged with abuse. Five years after that day, Msgr. Viganò accused Pope Francis of a «grave, disconcerting and sinful conduct» for having “covered” McCarrick and disregarded Benedict XVI’s (alleged) prohibition towards him. What comment does Msgr. Viganò want to make on his “grave, disconcerting and sinful” conduct for having been complicit in the disobedience of the Pope Emeritus’s order, and for having even celebrated the Eucharist together with a Cardinal leading an immoral life, which Viganò himself admitted he had known long before that date? 3) MSGR. 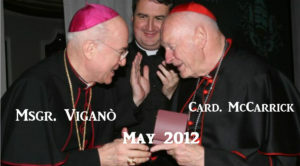 VIGANÒ, WHY IN 2012 DID YOU PUBLICLY SAY THAT “CARD. McCARRICK IS VERY MUCH LOVED BY US ALL”, WHILE SPEAKING ON BEHALF OF BENEDICT XVI? 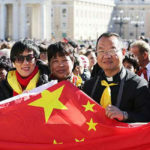 Viganò himself, who today accuses Francis of having “covered” McCarrick, of having disregarded Benedict XVI’s alleged order to the Cardinal to withdraw to a private life of prayer, participated in 2012 in a public event in which he proudly praises McCarrick as “ambassador” and states, in front of everyone, that he is a Cardinal loved by him. Exactly that Cardinal known by Viganò to have led an immoral sexual life. The picture and the video demonstrate, first and foremost, that McCarrick disobeyed that alleged Ratzingerian order already during Ratzinger’s Pontificate (which makes Viganò’s charges against Francis collapse, as we have explained), but Viganò was complicit in all this. Why did Viganò not protest? Why did he not go away, publicly reminded the guests and the organisers that it was not opportune to award McCarrick, both because of his immoral conduct and because of the order of the Pope in charge? Why did he participate therein and publicly congratulated with McCarrick, by going so far as to talk about affection for him? Why did he get on the stage and so justify, on behalf of the Pope himself, the award ceremony for a Cardinal who he knew was an abuser? Diplomacy? However, Viganò showed not to care much about diplomacy and went so far as to lie even to Benedict XVI in order to object to his transfer to the USA. And then, was his love for the Church, for justice, and for moral righteousness, about which he often talks in his dossier, replaced with good manners relationships? He might have limited himself to participate in soberer a way without making exaggerated “loving” compliments to the Cardinal. «Being a long-standing and cautious diplomat, he could have invented whatever excuse like a sudden commitment or an equally unexpected cold, and thus avoid travelling from Washington to New York to pay homage to the cardinal abuser» – it has been rightly observed. Father Andrew Small, director of the Pontifical Missions Societies, anyway reported publicly that Viganò never tried to dissuade him publicly honouring the Cardinal. 4) MSGR. VIGANÒ, WHY DID YOU AND YOUR FELLOWS LIE SAYING THAT BENEDICT XVI HAD CONFIRMED YOUR DOSSIER? The Viganò dossier was prepared and made publishable by three notorious haters of Francis: Marco Tosatti (the main proofreader), Timothy Busch, and Aldo Maria Valli. Busch, owner of the TV network EWTN (including the National Catholic Register), told the New York Times that those in charge of the publication of the dossier had personally assured that Benedict XVI had conformed Msgr Viganò’s account. One does not understand to whom he is alluding, since he was one of those in charge of the publication: is he perhaps placing the blame on Tosatti? Or is he blaming Viganò himself? Certainly, the ex Nuncio is in close touch with them and did not distance himself from Busch’s statements (he could have done so during the interview released to Valli). However, Ratzinger immediately denied it (here the original version) through his personal secretary Georg Gänswein (already used in the past to manifest his full support of Francis’s pontificate): «Pope Benedict has not commented on the ‘memorandum’ of Archbishop [Carlo] Viganò and will not do so», thereby labelling the words of Viganò’s fellow as “falsehoods”. And he repeated it with indignation to La Stampa: «I strongly state it: this is a fake-news, a lie!», so as to let all the disdain of the Pope Emeritus for the “Viganò operation”. Thus, the ex Nuncio and his proofreaders lied another time by involving the Pope Emeritus, too, in their dirty work. Why, Msgr. Viganò, did one one your collaborators have to invent – with your approval, since you have not exposed him – a confirmation of your account by Ratzinger? In his testimony, Msgr. Viganò remembers when McCarrick was nominated Cardinal by John Paul II in 2001. The former Nuncio thus decides to involve the Polish Pope in this matter. Let us quote him: «The faithful insistently wonder how it was possible for him to be appointed to Washington, and as Cardinal» – writes Viganò. «Was McCarrick’s appointment to Washington and as Cardinal the work of Sodano, when John Paul II was already very ill? We are not given to know. However, it is legitimate to think so, but I do not think he was the only one responsible for this». Msgr. Viganò states that in 2001 John Paul II would have been “very ill”, but this is the (umpteenth) lie. As has been pointed out out and everyone can verify, «in 2001 John Paul II had a perfectly lucid mind (he would die in 2005). And thus was he ill also when he appointed McCarrick Bishop and Archbishop? When he appointed him as Bishop in Metuchen (1981), then in Newark (1986) and eventually in Washington (2001)?». The ex Nuncio first involves the Polish Pope and then tries to take any liability away from him by falsely defining him as “ill” and therefore incapable of perform his role, so as to invalidate all Wojtyla’s acts after 2001. This is a serious accusation by an Archbishop and a former Apostolic Nuncio, and we are dealing with another lie of the Italian Archbishop which makes his credibility always more precarious. 6) MSGR. VIGANÒ, WHY DID YOU LIE SAYING THAT FRANCIS WOULD HAVE ASSAILED YOU IN THE 2013 MEETING? Always taking Msgr. Viganò’s dossier seriously, we read that the former Nuncio remembers a meeting he had on the 21st June 2013 with Pope Francis at the end of the audience. Here are Viganò’s words: «When it was my turn, I just had time to say to him, “I am the Nuncio to the United States.” He immediately assailed me with a tone of reproach, using these words: “The Bishops in the United States must not be ideologized! They must be shepherds!” Of course I was not in a position to ask for explanations about the meaning of his words and the aggressive way in which he had upbraided me». Despite this, the facts are, once again, different. As discovered by Cindy Wooden, the Vatican Television Center’s video of the meeting shows that the Pope welcomes Viganò in a benevolent way, with kindness, and – as comments Tornielli – as soon as Viganò introduces himself, the Pope does not assail him «immediately with a tone of reproach», but rather thanks him lovingly for his work. Then, with a more serious expression, the Pope communicates something to the Nuncio, but the video stops: the Vatican TV never divulges the private words. A detail? Yes, in this case, it is. But the little lie of Msgr. 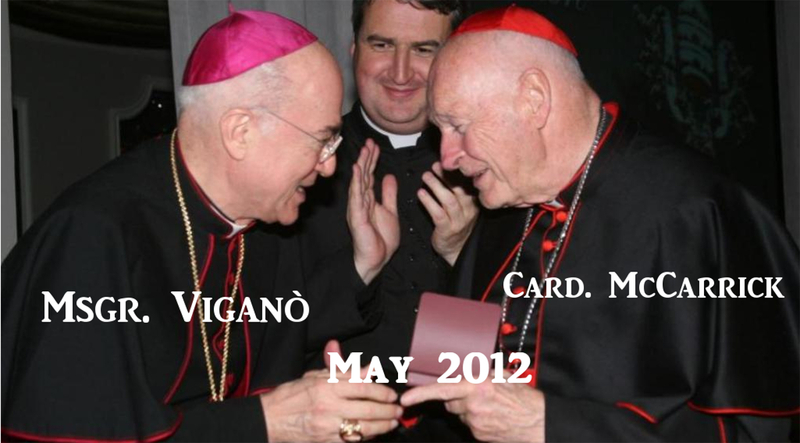 Viganò (or his having misremembered) adds to the evidence (already shown by the case of Card. Cupich, who corrected the false information, or the false memories, of Viganò) that the Prelate is driven by a personal hatred against Francis which pushes him to lie (or misremember) in order to show the Pontiff in a bad light with malignant gossip, as happened in this case (and this may occur and has occurred in many other parts of the dossier). «It’s as if the Borgias and the Medicis had Twitter accounts» – commented Christopher Bellitto, Professor of Church History. Francis is right not to answer the dossier: «Vigano’s playing a game, it’s a game that’s 2,000 years old, and Francis is saying, ‘I’m not playing games, I have other things to do’». 7) MSGR. VIGANÒ, WHY DO YOU NOT PROVE THE ALLEGED ADMONISHMENT OF McCARRICK BY BENEDICT XVI? 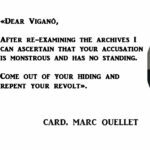 The core of Viganò’s dossier, as we have understood, is the order given by Benedict XVI to Card. McCarrick to lead an isolated life, as a result of knowing the information/dossier on his past homosexual behaviour with adults. The charge against Francis is to have disregarded this order and to have rehabilitated McCarrick, by allowing him to frequent the Vatican and the Catholic life in New York. Viganò does not quote any document, but asks us to trust his account: «But finally I learned with certainty, through Cardinal Giovanni Battista Re, then-Prefect of the Congregation for Bishops, that Richard Sipe’s courageous and meritorious Statement had had the desired result. Pope Benedict had imposed on Cardinal McCarrick sanctions similar to those now imposed on him by Pope Francis: the Cardinal was to leave the seminary where he was living, he was forbidden to celebrate [Mass] in public, to participate in public meetings, to give lectures, to travel, with the obligation of dedicating himself to a life of prayer and penance. I do not know when Pope Benedict took these measures against McCarrick, whether in 2009 or 2010, because in the meantime I had been transferred to the Governorate of Vatican City State, just as I do not know who was responsible for this incredible delay». Nobody has ever heard about this sanction on the part of Ratzinger; there is no record thereof. If Viganò tells the truth, it must have been a secret order. But this would be an anomaly, as a Canon Lawyer declared: «It’s an anomaly not to publish a sanction that has public consequences, such as forbidding the cardinal to celebrate Mass publicly or make public appearances». Sister Sharon Euart, Canon Lawyer and Director Resource Center for Religious Institutes, explained that there is always a written notification in these cases, and whoever has jurisdiction over the offender would normally be notified of the penalty so that the offender could be monitored, which is why it is almost impossible and not explicable that this order remained secret. Instead of fleeing to a safe house (as if he were Julian Assange) and changing his telephone number to make himself unreachable, why does Viganò not prove objectively what he states? The burden of proof is on him. Even so, not much would change, since we have demonstrated how McCarrick freely untroubledly frequented the Vatican long before Francis, but at least one would stop doubting that Viganò lied on this key passage, too. The request is also addressed to Card. Giovanni Battista Re, who certainly is aware of everything: why do they not confirm it? Is it a lie? Or are there other reasons? 8) MSGR. VIGANÒ, WHY DO THE VICTIMS OF PAEDOPHILIA SAY THAT YOU ARE EXPLOITING THEM FOR YOUR IDEOLOGICAL BATTLE? Reading Viganò’s dossier, one perceives how the ex Nuncio justifies his coming into play to eliminate the corruption inside the Church and acting as the defender of the victims of priestly abuses who need justice and no other cover-ups. For this, he denounces «the conduct of Pope Francis and the conspiracy of silence of many pastors» as «grave, disconcerting and sinful». However, if we listen to the combative associations of victims, not even they believe Msgr. Viganò’s moral intention. The supervisors of BishopAccountability, the largest database concerning the sexual abuses by the clergy, rejected the request addressed to Pope Francis to resign. The group of victims called Ending Clergy Abuse defined, instead, Viganò’s letter as part of the «infighting between curia factions that are exploiting the abuse crisis and victims of clergy sexual abuse as leverage in the struggle for church power». The impression of a merely political attack masked by the excuse of the fight against paedophilia is the one many – almost all – had (see, for example, the editorial of La Nazione or the letter to Viganò from a country priest). Besides, the tone of the slapdash dossier exactly follows the traditionalist rhetoric of the blogs of the haters of Pope Francis, two of whom are even the redactors of the Viganò dossier (already renamed “Tosatti-Viganò papyrus”). It is the most successful frontal attack by the mixture composed of right-wing conservatives, anti-conciliarists, sedevacantists, and traditionalists, who have united in the last years because, as written by Massimo Faggioli, «the Pontificate of John Paul II (with Cardinal Ratzinger at the ex Holy Office) served as a shelter with respect to those fringes which, only some years before, had chosen the way of Marcel Lefebvre’s formal schism». The doyen of the US Vaticanists, John L. Allen, commented indeed: «The same holds true with the people who advised Viganò, and the media outlets that first published his document: They all have strong conservative credentials, and none are recognized experts or leaders of reform efforts on the sexual abuse scandals». What emerges is well summarised by the words of Damiano Serpi: «Accepting the Pope’s challenge, one will be indeed able to read those endless words of ex Nuncio Viganò for what they really are, that is the last clumsy attempt in order of time to delegitimise the Pope’s work. Now this is being done by heavily and dangerously exploiting an issue, that of paedophilia inside the Church, which is anguishing all of us faithful. The time, the ways, and the contents of what Viganò has written cannot be all only coincidences. It would be too foolish to think so, let alone believe it. Why diffuse – precisely after the apostolic visitation of Ireland – certain pieces of information dating, if truthful, back to 5 years ago? Why do it with the tones of who considers himself a victim without, though, repenting for having been himself the first not to have done anything and to have kept silent, if the charges are true? 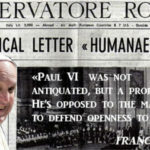 Why use the media notoriously contrary to the Pontificate of Francis to release this letter to the great public instead of accepting the confrontation? What one reads throughout that text is the unease of a man for having been put aside and the terrible and oppressing need to remedy it somehow. 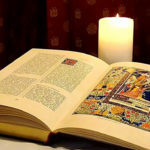 That text was written, composed, elaborated, and diffused with the only goal of sowing doubt, causing a sensation, and fomenting that suspicion corroding any certainty, even the solidest one. In sum, rather than justice, that text aimed to create and provoke clamour, scandal, uncertainties, doubts, and gossip. Passing Pope Francis off as one of the many priests, Bishops, and Cardinals who covered their own subordinates or brothers is the lowest attempt to put in place strategies already used in the past with the posters affixed in the night around Rome, with the public diffusion of a false report on the Orlandi case and with the false accusations of heresy. All the episodes in which established truths and fanciful hypotheses with the only goal of scaring the reader and making the seed of doubt and of the most atrocious suspicion sproud inside his mind». Our questions are over. Msgr. Viganò is the first to have to give clarifications because he appears to be a totally unreliable witness who is himself complicit in the coverage he denounces. The here proved unsustainability of his charge against Pope Francis (in addition to our precedent article) must not, though, dismiss many circumstances which the Nuncio reveals and which may correspond to reality (the gay lobby, the cover-up, etc.). 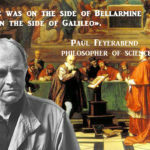 For this reason, a serious investigation is what everyone expects, and, as has been written, the perplexities «refer to a period preceeding the election of Pope Francis: amongst them, how it was possible that a prelate whose sexual appetites to the detriment of seminarians and young priests were known by many Theodore McCarrick, became Bishop, then Cardinal of Washington – the capital of the USA –, and for years one of the figures of reference for the American Catholic establishment. The Pope is clearly under attack for reasons which are not the emergency of the issue of sexual abuses and which have to be looked for in the rejection of the theology and vision of the Church of the Argentinian and Jesuit Pope by the Catholic North American conservatism. Francis’s worry is evidently to defend not himself, but the Church. In this sense, the choice not to answer on the airplane the questions on the “report” by the former Nuncio of the US reveals in Francis a cautiousness and a sense of responsibility which many lack in the Church today». The Viganò dossier is another missed opportunity: it could have been helpful to the Church, but succumbed to the traditionalist pressures (guided by the proofreaders, for example) to exploit all this for a petty objective: hitting Francis. 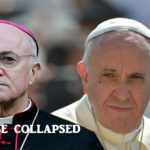 Viganò cooperated or was really its author by giving the world a miserable show. What does the infighting of the Prelates and their scribblers fed with ideological and political interests have to do with the Church? Prayer for some of the leaders in our Church. Lord, source of eternal life and truth, give each of your shepherds, Pope Francis and Carlo Vigano, a spirit of courage and right judgment, a spirit of knowledge and love. Let them be reconcilied to one another as they serve you as their common Father. By governing with fidelity those entrusted to their care, may Francis, as successor to the apostle Peter and Vicar of Christ, and Carlo continue to build Your Church into a sacrament of unity, love, and peace for all the world.